How to export from Armenia? What are the export registration procedures, export customs process, export cargo movement methods in Armenia? How to export from Armenia? 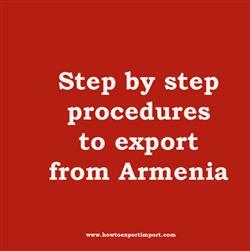 This post explains about step by step procedures that need to be finished with Armenia government authority for exportation from Armenia. If you need to export goods or services, a onetime registration procedure is being completed in most of the countries. Such export licence may be obtained from concerned government department if required in Armenia. Armenia’s customs policy is administered by the State Revenue Committee and they are responsible for levies taxes on goods efficiently, implementation of customs policies, facilitate legitimate trade and protection of the society and legal economic activities. This post explains about different phases in export process that every exporter needs to go through for completing export from Armenia.